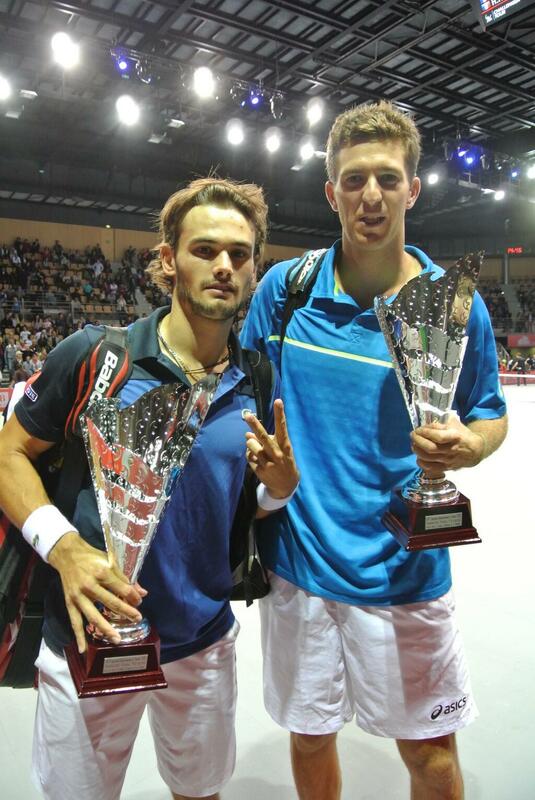 Berrer, Martin/Nys Are Your Mouilleron-le-Captif Challenger Champions! The rambunctious crowd at the Mouilleron-le-Captif* Challenger had a few Frenchmen to cheer for on today’s finals docket: 2nd seed Nicolas Mahut, playing 33-year-old German Michael Berrer in a singles duel between tour vets; and unseeded Fabrice Martin and Hugo Nys, competing in the doubles final against the back-from-injury-and-doing-well Henri Kontinen and his “Spanish matador”** Adrian Menendez-Maceiras. The crowd was lively from the very start, clapping their rhythmic support of Martin/Nys even in the beginning games of the match. It didn’t work early on, however, as Kontinen/Menendez-Maceiras took the 1st set 6-3. But the French never flagged. After three service holds to start the second set, Martin waved his arms at his sides, exhorting the crowd to get even louder at 15-all on the Spinnish serve. The result was a break for *3-1, the happy spectators chanting “HUGO! *clap clap clap* FABRICE! *clap clap clap*”. And that break must’ve been made of very sticky stuff, as the Frenchmen made it stick quite easily and closed out the 2nd frame 6-3. So it was on to the Stupor Tiebreak to settle things. Menendez-Maceiras broke out his tactical grunting early on, and the French grunted mockingly in return. They spoke with their rackets too, getting the first mini-break blood and changing ends up *4-2. Turns out Kontinen had a mini-break Band-Aid, however, and the Finn mini-broke back with a splendid one-handed backhand return up the alley. The French team responded by moonballing, lobbing and ultimately poaching their way to another mini-break, and ends were changed again at 7-5*. They then closed out the match 3-6 6-3 10-8 in front of an elated home cheering section. And it was on to the singles final. Mahut jacked up the already upjacked crowd to a fever pitch, getting an early break and then another to feed a ‘stick to the hefty lefty Berrer, 6-1. 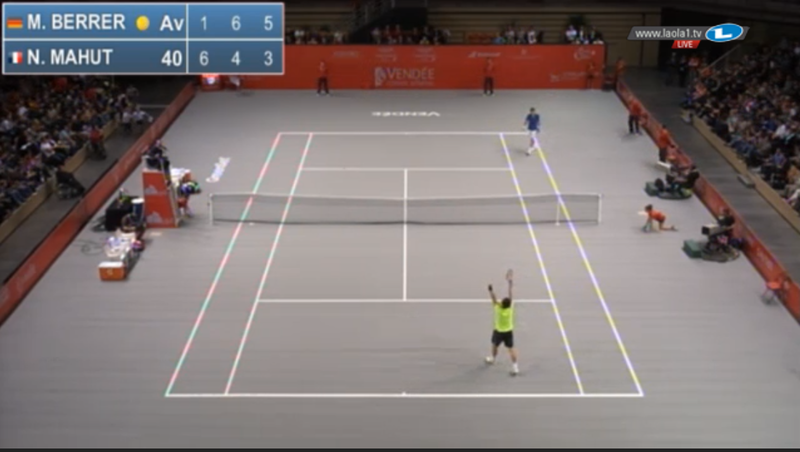 With the fans in the stands doing their best chanting and clapping, both players held serve until 5-4. Then Mahut double-faulted at 30-all, and Berrer siezed the opportunity, taking the net and pressuring the Frenchman into a forced error. Just like that, Berrer had stolen the 2nd set 6-4. And he wasn’t gonna give it back. The 8th seed played his role of the spoiler brilliantly, getting two break points early in the third set with deft passing shotting, then converting the break on a super point in which Mahut made a dive volley, only to miss an overhead on the next ball. The big GER man played smart, aggressive and well-executed tennis, keeping Mahut on the defensive and coming forward at every opportunity. With the crowd still urging their man gamely, Mahut saved a match point, but Berrer quickly conjured another with an ace. And then closed the deal, taking the title 1-6 6-4 6-3. As one observer noted, beating the top two seeds, Michael Llodra and Mahut, indoors in France was just about the best you can do at the Challenger level. What a week for Berrer, who will rise over 30 places and back into the Top 150 when the new rankings are released. The win was Berrer’s tenth challenger title in thirteen finals. *now that the tourney’s over, I really hope they free the captive.